‘BARRY PALSER’S SUPER SIX’ were back to give us their own special entertainment on Friday, 23rd May 2014 here at our Farnborough Jazz Club. Band leader BARRY (trombonist/vocals) (who ran Savoy Jazz Band for more than 55years) had booked ALAN GRESTY on trumpet/vocals (28years with Monty Sunshine Band), JOHN CROCKER on reeds/vocals (34years with The Chris Barber Band), JIM DOUGLAS* on banjo/guitar, HARVEY WESTON on double bass (both with The Alex Welsh Band – Jim 18years & Harvey 6years) and GRAHAM COLLICOTT (drums). They certainly were a contending jazz band to match last week’s and did we enjoy another brilliant evening, we certainly did! As I remarked last week, obviously, all the bands (that appear, or have appeared here) have their own brilliance, bringing their own interpretation of jazz we love, with absolutely fabulous traditional jazz, producing a great club ambiance. So what did they play? Well, they started the evening off with ‘Bourbon Street Parade’, a great favourite (I have no concrete evidence of when Paul Barbarin wrote it, hence circa 1953). The next number, ‘Riverboat Shuffle’ was chosen by everyone to do our line-dance. Barry called us “The Farnborough Jazz Formation Team”, caw Barry, we could end up next year on ‘Britain’s Got Talent’, ha. He then introduced John who sang ‘I’m Gonna Sit Right Down and Write Myself a Letter’. He continued to say John is a fantastic musician, very funny with the jokes and a super singer – a good all-rounder, just like Ian Botham is to cricket. John also carried on to feature the next number, that beautiful song ‘Tangerine’. John showed his wonderful talent playing tenor sax. A hard act to follow, but Alan did so, making a smashing job with singing ‘Baby Won’t You Please Come Home’. What happened next was Barry telling everyone how when I phoned to confirm who would be in the band, he jokingly answered “What, are we with you soon”? With one personal problem after another, I really thought ‘Oh no, I’ve got everything wrong’! So to make up for the shock, Barry dedicated the next number as ‘Christopher Columbus’. Bless him for remembering it was one of my favourites. The next number was ‘Fidgety Street’ great to dance to. Barry has an excellent jazz voice, shown when he sang ‘Louisiana’, another favourite jazz ‘standard’. They finished up with ‘Back Home Again in Indiana’, completing yet another fabulous evening. Their next date here is 29th August 2014. * Jim has written a book called ‘Tunes, Tours and Travel-it is’. It’s about eighteen years of facts, faces and fun with the Alex Welsh Band, available through Amazon for $13.50, or email us for Jim’s contact details, if you live in England. N.B. At one point during the evening, Barry mentioned someone had argued the point of who composed a particular number (Barry proving to be correct). Not sure who that was, but I hope if I ever get something wrong, someone will please let me know. I usually try to find original song manuscripts, but not always possible, so please correct me as and when. Thanks. This entry was posted in Barry Palser's Super Six on May 29, 2014 by Diane. TONY PITT’S ALL STARS at Farnborough Jazz Club on 16th May 2014, was truly a night to remember. In Keith’s words, this superb band featuring some of the top musicians in British Jazz. The line-up included the powerful trumpet of DENNY ILETT, the top class trombone playing of DAVE HEWITT and the fabulous soprano and tenor sax of AL NICHOLS. A great front line, driven along by a swinging rhythm section, which included ANDY LAWRENCE’s strong double bass playing, JOHN ELLMER’s fantastic drumming and leader Tony Pitt- solid as a rock- on banjo. This was a memorable performance at the Farnborough Jazz Club, with the band looking smart and professional, bringing back visions of the great Alex Welsh band of the 70’s and 80’s (we should have recorded it). I missed jotting down their first number as people were pouring in, but recall John produced a fabulous drum solo in ‘Do You Know What It Means to Miss New Orleans’. Also Denny sang ‘Tin Roof Blues’ (with Al playing soprano sax). Then Denny performed a beautiful solo intro to the next number ‘Maggie’. He also sang it and then ended it in the same way, so wonderful. Dave had a feature, playing ‘If I had My Way Dear’, what a performer, obviously brilliantly backed by the ‘engine’. They also backed Denny, who featured with ‘Bad Penny Blues’ (Denny sang it too). I don’t need words to describe Denny, he’s just the best. ‘Big Butter and Egg Man’ was another great number to which they all excelled. Al also had a feature number, ‘Avalon’, playing tenor sax, another brilliant musician. Nobody wanted the evening to end, but they chose ‘When the Saints Go Marching In’ to do so, obviously just the right number AND I did manage to record it on my old mobile phone. I did say last week, to expect some incredible jazz, I also said, one definitely NOT to be missed as these musicians are certainly top-notch. I was right, what a night. The band were steaming. They enjoyed what they were producing themselves, so much so, they forgot to stop and played on till 11.45pm and I’m sure they could have played on and on. Tony’s band is back with us on 15th August 2014, to celebrate Keith’s birthday. This week, Friday 23rd May 2014, we will be featuring a band of similar quality and style – BARRY PALSER’S SUPER SIX, so come along and enjoy a great evening of Happy Jazz! ‘When the Saints Go Marching In’ – origins unknown (derived from (m) James Milton Black, (l) Katherine Purvis 1896) re-publ 1927. This entry was posted in Tony Pitt's All Stars on May 15, 2014 by Diane. 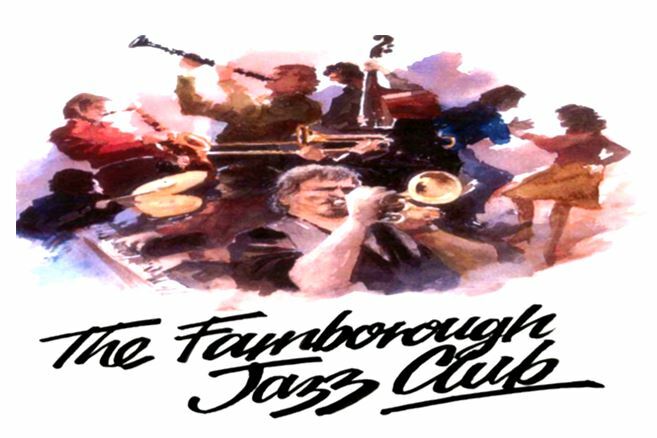 MIKE BARRY’S UPTOWN GANG was the band here at the FARNBOROUGH JAZZ CLUB on 2nd May 2014 Band leader Mike (trumpet/vocals) had booked GOFF DUBBER on clarinet/saxes/vocals, ‘WHISPERING’ MIKE HOLT on trombone/vocals, GRAHAM BARTON on piano, ROGER CURPHEY on string bass and GRAHAM COLLICOTT on drums. The evening was another success, with such songs as Louis Armstrong’s hit number, ‘East Coast Trot’, (they played it up-tempo) and ‘Fidgety Feet’. Keith has an infected toe, so Mike introduced this tune as ‘Fidgety Foot’. It is cheeky subtle one-liners like this that make our evenings at Farnborough. The atmosphere is always fun and the music always professional, with bands like Mike’s. Some of their repertoire included their own version of ‘Isle of Capri’ which was excellent. To follow was the wonderful and unique sounds of ‘Whispering Mike’s vocals with ‘Wrap Your Troubles in Dreams’ (a Bing Crosby hit). ‘Dippermouth Blues’ is a great jazz favourite, with audiences calling out “Oh play that thing”, however, we did our line-dance, so missed that moment of jumping to ones feet at that point. Loved the dancing though, always lots of fun. The next number ‘The Gettysburg Address’ was terrific and must mention impressive drumming by Graham. Mike featured next, accompanied by Roger and Graham with ‘Davenport Blues’. What a beautiful effort too. My last number is ‘Bourbon Street Parade’ and just loved the trio harmonising vocals of both Mikes and Goff. It finished another wonderful evening with everybody leaving wearing huge smiles on their faces and that is what it’s all about, always good jazz. This entry was posted in Mike Barry's Uptown Gang on May 4, 2014 by Diane.